The discount belts we offer are high quality and only from the most trusted and recognized belt manufacturers in the world. We stock a large inventory of top quality, durable, and reliable parts. 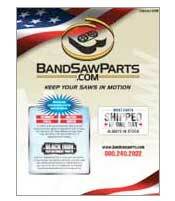 Browse our user-friendly online catalog to find the parts you need. Orders are shipped within a 48-hour frame from the time the order was made. We stock and sell drive line parts that fit one of the best names in the sawing industry DoALL is an outstanding U.S manufacturer of all the sawing needs; band saw blades, sawing machines, great cutting fluids, and top of the line material handling systems. Wheel Bearings These Idlewheel Bearings are mounted on inside of the wheel. 2 Bearings are required. Belt* This Variable Speed Belt Mounts between Motor Pulley and Variable Speed Pulleys. Drive Belt* This variable Speed Belt mounts between Variable Speed Pulleys and Primary Drive Shaft. Driven Belt* This Variable Speed Belt mounts between Variable Speed Pulleys and Primary Drive Shaft. Blade Guard L.H. * This guard covers the exposed sawblade between Guide Arm and Idlewheel.